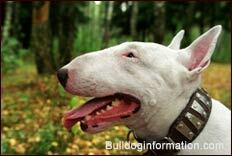 The Bull Terrier is a British dog breed with a very distinctive and unusual appearance. 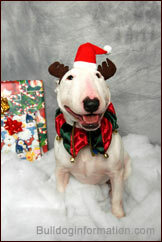 Now an affectionate companion, the Bull Terrier arose from "Bull and Terrier" crosses, originally bred for dog fighting. 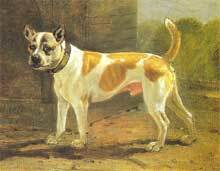 When bullbaiting was outlawed in England in 1835 the "sport" of dog-fighting became popular and a smaller dog breed was needed, that could be more easily hidden under one's coat at the arrival of the police. 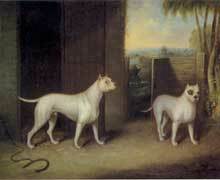 These dogs also had to be more agile and light as the dog fights usually lasted longer than bull fights. Detail of an oil painting by Benjamin Marshall. This new type of fighting dog was created by crossing the olde type bulldog with different Terriers, among which the Manchester Terrier (or Black and Tan Terrier) - before it was dwarfed down - . 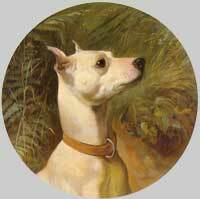 In the early 1850, James Hinks, of Birmingham, England, first standardized the breed by selectively breeding the old type Bull Terrier with other breeds, including the White English Terrier (now extinct), to obtain a longer head and a more symmetrical body and get rid of the bowed legs. 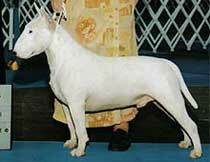 The result was an all white Bull Terrier with a cleaner outline, tight shoulders and well bent stifles. © by C. Marien-de Luca for The Canine Information Library and The Bulldog Information Library 2003-2009. 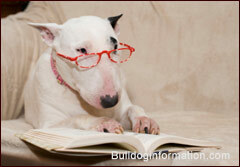 The Canine Information Library and Dogbreeds.bulldoginformation.com 2003-2009 © All rights reserved. Reversely, the bull terrier contributed to the gene pool of such powerful and remarkable breeds as the dogo argentino and the Japanese Tosa inu. 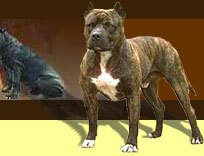 The breed's most distinctive feature is its egg-shaped head, with a skull profile completely lacking a stop. 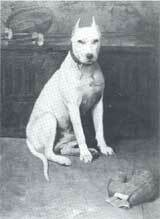 The first modern Bull Terrier showing this feature was born in 1917 and called Lord Gladiator. 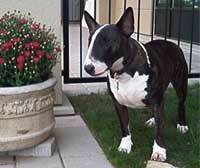 Bull Terriers also feature in several television shows and movies, including the Dickensian musical of 1968 "Oliver! ", and the award-winning screen biography "Patton". 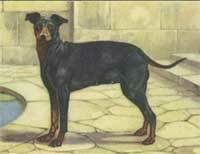 President Teddy Roosevelt owned a Bull Terrier.